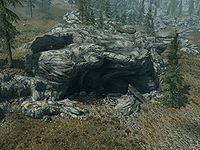 Greenspring Hollow is a shallow cave located northwest of Whiterun, near Dustman's Cairn. The cave is located under a rock overhang. It is the den for a vicious leveled animal, often a sabre cat even at low levels. As you approach the outcropping, a single predator will likely attack you. Once it is dealt with, you can safely check out the creature's den. From the look of things, a foolish hunter decided to camp here and paid with his life. His body can be found in the middle of the blood-splattered ground, next to a fallen cooking spit. Some skeletal remains, which can be looted, can be found further back next to two unusable bed rolls. The hunter's lean-to has a total of ten pelts of various animals. There is an apothecary's satchel, a small coin purse, and a bear trap near the lean-to. A leveled-locked chest lies at the back of the outcrop. A copy of the book Argonian Account, Book 2 rests on a boulder beside the chest, with a random bow next to it. On the left side of the outcropping is a tanning rack. A leg of goat, a piece of horse meat, and some venison can be found hanging from the ceiling on a rope. Several fungi growths can be found around the camp, namely two clusters of fly amanita, a Namira's rot, and an imp stool fungi. Follow the nearby stream to locate a nirnroot and a gold ore vein at the lake's shore. You may encounter a few more predators in the area as well. Only the containers respawn; the leveled-locked chest, the skeletal remains, and apothecary's satchel. All other items are only there the first time and that includes the body of the hunter. So any radiant quest that requires recovering an item can be completed here after it has been cleared. The animal does not respawn, which makes it impossible to complete Animal Extermination if Aela asks you to clear out this location and it has already been cleared previously. This page was last modified on 7 January 2019, at 05:41.